First introduced in 2008, DisplayPort are the newest digital display interface standard designed to replace DVI and eventually HDMI. DisplayPort delivers much higher performance, resolutions, and color depth. DisplayPort can transmit both audio and video over the same cable with higher resolution and other benefits than HDMI. DisplayPorts are all digital and feature a small, user friendly connector, supporting cable lengths up to 35 feet long. DisplayPort has audio and high definition content protection capabilities, and is designed to support the latest chipsets, graphics, LED, and other high resolution display technologies. NTI offers several multi display video cards featuring DisplayPort, and all of our QuadStation computer systems come standard with DisplayPort technology. There are two sizes of display ports. Regular size and “mini” DisplayPort. The quality of the video is the same in both styles, the difference is merely the physical connection. There are several versions of DisplayPort (on the port itself) but keep in mind to utilize the higher end resolutions such as 4k, you must also connect with a matching higher res cable and displays. Distance limitations are based on which DisplayPort version you are using as well as the quality of the cable used, see below. Color depth is based on type of connection, see Color Depth below. Resolution up to 4k – 4096 x 2160 @60hz (using DP certified UHD cables and display) | 19:10 aspect ratio. Resolution up to 4k – 3840 x 2160 @60hz (using DP certified UHD cables and display) | 16:9 aspect ratio. Convertable to VGA, DVI or HDMI with an adapter. Resolutions will be based on what it is converted to. Same specs as v1.2 but adds an optional feature called Adaptive Sync (see below). Resolution up to 5k – 5120 x 2160 | 21:9 aspect ratio. Resolution up to 8k – 7680 x 4320 |16:9 aspect ratio. Resolution up to 8k – 8192 x 4320 | 19:10 aspect ratio. HDMI v1.4 – Resolution up to 3820 x 2160 @ 30hz. HDMI v2.0 – Resolution up to 4096 x 2160 @ 60hz (using high speed HDMI cables). Maximum throughput 18 Gbps (using high speed HDMI cables). HDMI v2.1 The HDMI 2.1 spec supports 8K resolutions at 60Hz, and 4K resolutions up to 120Hz thanks to a new 48Gbps Ultra HDMI cable. The cable is backwards compatible with earlier versions of the HDMI specification and can be used with existing HDMI devices. Note that HDMI v2.1 was announced in Nov 2017. As of mid 2018 there is no DisplayPort to HDMI v2.1 adapter that support 5k. Also, to get 5K resolution using DisplayPort, it will always require TWO DisplayPorts on the video card for EACH 5k (or higher) display. Using Display port to DVI cables or adapters – Max resolution 1920 x 1200 up to 10ft. What do i need to use DisplayPort? A DisplayPort supported video card, monitors and cables. Distance and resolution capabilities are based on all 3 of these variables. Do I need special cables for different versions of DisplayPort, v1.1, v1.2 etc? Yes depending on the DisplayPort port on the video card used. For example, if you are looking to get 4k resoltion your video card, cables and monitors all need to supports DisplayPort v1.2 or higher to obtain that objective. The connection from the source all the way through to the output display must be in harmony. If you plan on using DisplayPort to HDMI/DVI/VGA you will get the max resolution of whatever you are converting to. For example if you have a DisplayPort video card with a DP to DVI adapter your max resolution will be 1920 x 1200 (DVI single link) or 2560 x 1600 (DVI dual link). Technically you are reducing down when you add an adapter. However, most users utilize 1920 x 1080 HD monitors these days, so an adapter with a regular DVI cable is more than enough. Do i need special monitors for DisplayPort? Yes. To utilize the higher resolution capabilities of DisplayPort you must have a monitor with a DisplayPort connection. Converting from DisplayPort to anything else is not the same. What are the most significant benefits for the user? [Display Port Certified] The main product benefits are that DisplayPort provides improved performance as a standard feature relative to DVI, and can be packaged into a USB-sized connector for space-constrained applications like notebooks and graphics cards. DisplayPort also enables ultra sleek, easy to use direct drive flat panel monitors and sets the stage for future display features such as single-cable multi-function monitor connectivity and daisy chained displays. DisplayPort enables a wide range of connectivity options to monitors, projectors and HDTVs via a single connector, making it an easy, universal and cross-application solution. What other standards compete with the DisplayPort objectives? Is UDI a direct competitor? Will DisplayPort work with standards like HDMI and VGA, or replace them? Will content protection be implemented in the specification, and how? 4K resolution refers to a display device or content having horizontal resolution of about 4,000 pixels. 4K has become the common name for ultra high definition television (UHDTV), although its resolution is actually 3840 x 2160 (16:9 aspect ratio), which is lower than the 4K industry standard of 4096 x 2160 (19:10 aspect ratio) introduced in digital cinemas. However, 4K is used so widely to describe 3,840 x 2,160 displays and content now that the roots of the technical distinction between the 4K and UHD terms have been all but lost outside of the projection world. In other words, for most people the two terms have become interchangeable. 4K = Ultra HD. To utilize 4K resolution (3820 or 4096) of course you will need a TV that supports resolution that high and they are not cheap. Most TVs as of 2014 are firmly standardized on 1920 x 1080 HD resolution, however 4k TVs are becoming more common. One final note on connectivity, to connect to a 4K TV, you will need to use either DisplayPort or HDMI + Ultra high def 4K style HDMI cables. See more on HDMI adapters and cables below. The new HDMI 2.1 standard spec supports 8K resolutions at 60Hz, and 4K resolutions up to 120Hz thanks to a new 48Gbps Ultra HDMI cable. The cable is backwards compatible with earlier versions of the HDMI specification and can be used with existing HDMI devices. DisplayPort Adaptive-Sync is a new addition to the DisplayPort 1.2a specification, ported from the embedded DisplayPort v1.0 specification. DisplayPort Adaptive-Sync provides an industry-standard mechanism that enables real-time adjustment of a monitor’s refresh rate of a display over a DisplayPort link. The new technology will attempt to eliminate the problem by aligning a computer’s hardware to match up the system’s GPU with the monitor’s refresh rate. Adaptive-Sync is also rumored to be able to draw down refresh rates for less demanding tasks, possibly resulting in decreased power consumption. The DisplayPort Adaptive-Sync specification was ported from the Embedded DisplayPort specification through a proposal to the VESA group by AMD. DisplayPort Adaptive-Sync is an ingredient feature of a DisplayPort link and an industry standard that enables technologies like Project FreeSync. HDMI was designed as an HD TV interface, not a general-purpose internal and external display interface for computer equipment. Many of DisplayPort’s unique benefits, such as direct drive monitor design and single cable multi-function monitor connectivity are not available with HDMI. High resolution support and high performance are standard features of DisplayPort, whereas these are optional premium features of HDMI. Business and enterprise customers may not want to implement all of the consumer electronics features that are required in HDMI products DisplayPort is designed to meet the future needs of the PC industry while preserving compatibility with HDMI. While DisplayPort has a rich consumer electronics feature set, it is expected to complement and not necessarily replace, HDMI. DisplayPort is focused on PC, monitor, and projector usages as a replacement for DVI and VGA where high performance and backwards and forwards compatibility over standard cables are valued. 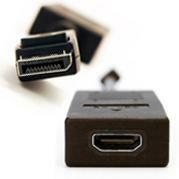 The DisplayPort connector is compatible with HDMI signals, enabling product interoperability. A multi-mode PC that implements both HDMI and DisplayPort only needs a simple DisplayPort cable adapter to make an HDMI connection to an HDTV. Direct DisplayPort to HDMI cables (M-M) are not allowed according to HDMI, LLC the licensing company overseeing HDMI specification. In 2011 they moved to have DP-HDMI cables recalled, but so far that has not happened. Good quality DP-HDMI adaptershowever, are allowed​. This would be a DP (M) to HDMI (F) adapter, then a HDMI-HDMI (M-M) cable would connect to the adapter and out to the display. There are ‘passive’ and ‘active’ DP-HDMI adapters in the market today that support “HDMI 1.4” (see above) which can drive Ultra HD and 30fps. Cable length restrictions are the same as for any HDMI-HDMI connection. Although there are longer HDMI cables, sticking with 10ft or less is a good rule of thumb if you play on using Ultra HD resolutions. Regarding mini and regular sized DP to HDMI adapters, there are different types. If you will be connecting to a regular TV then you could use a regular style DP to HDMI adapter and regular style HDMI cable. Also there are Passive and Active Adapters. You want Active and you will pay a lot more for them, about $30-$40 each vs passive adapters which are about $12. If you plan on connecting to an Ultra HD (high res above 1920 x 1200) such as a 4K TV you will use Ultra HD adapters + Ultra HD, HDMI cables with them to get the max res all the way through. As mentioned, when adapting from DisplayPort to DVI your maximum resolution will be 1920 x 1200. Remember DisplayPort connections are the best you can get. Adapting to anything is considered adapting DOWN to the lesser capabilities of whatever you are connecting to. In this case 1920 x 1200 is the max res on a DVI port, so you gain no benefit at all of a DisplayPort connection when you use DP to DVI adapters. You would use adapters if you have no other choice to connect directly. Max res on using this type of adapter is 1920 x 1200. If you must use a DisplayPort to VGA adapter, it must be an ACTIVE style adapter (not passive) or it will not work at all. Use this type of adapter only if you have no other way to connect. Active adapters are much more expensive than passive adapters. Remember connecting directly using native ports is always best, use adapter only if you have to. Max res on using this type of adapter is 1920 x 1200. ​​Based on the RGB color model, color depth (also referred to as ‘bit depth’) is the number of bits in each color component of one pixel or the total number of bits that indicate the color of a single pixel. 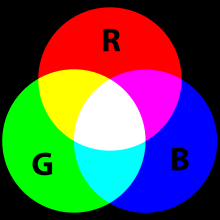 The RGB color model is an additive color model in which three primary colors (Red, Green, and Blue) are added together in various ways to reproduce a broad array of colors. For example, 8bit color x the 3 primary colors (R,G,B)= 24bits per pixel. “Daisy chaining” is a term that describes the ability to connect a series of devices together using a single connection between each two devices. Using DisplayPort v1.2 and above with chainable displays have both a DisplayPort input and a DisplayPort output. The DisplayPort output connects to the next downstream display. This cabling arrangement, with one DisplayPort cable between each set of monitors. Although this method is possible, it is not recommended to use multiple displays. If you need multiple displays the proper way to do this to have a computer that has multiple, individual connections such as our QuadStation systems. With daisy chaining you are basically splitting the resources of a single video port. Also See: Monitor Video Connections to compare all video cables and adapters. QuadStations are high performance, multiple monitor computer systems designed for serious professionals. QuadStations provide support for 2-12 independent displays and all of our systems support Display Port connectivity.